$1 they raise in most campaign contributions. Do you agree or disagree with this proposal? Visit us on Facebook to let us know, or comment below! 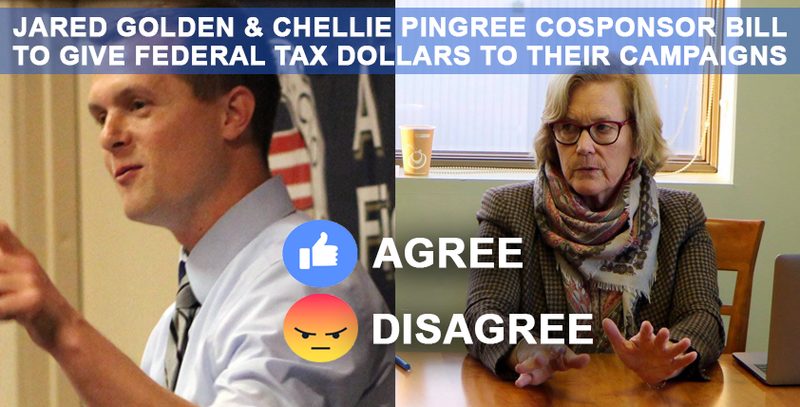 WASHINGTON – Representatives Jared Golden and Chellie Pingree from Maine have both signed on as cosponsors of a bill that would provide their re-election campaigns “matching” federal tax dollars for most contributions they collect from private donors. For Golden that could mean as much as $9 million in your federal tax dollars pumped into his campaign coffers in 2020 if his fundraising keeps pace with his 2018 numbers. The sweeping bill, HR 1, has stirred controversy for many of the changes the bill proposes, but perhaps no piece would have a more profound impact on the state of American politics than the “matching” federal funds proposal. Candidates for federal office would receive $6 from federal taxpayers for every $1 they raised from most contributions, excluding only contributions above a $200 threshold, according to multiple sources, including vox.com. For Jared Golden in 2018 that would have meant collecting about $9 million in additional campaign funds from federal taxpayers to match the $1.5 million of his donations that would have qualified for matching funds, and adding it to the $5.7 million he raised total in what has been reported as the most expensive campaign in Maine history. A review of Golden’s qualifying contributions show that only about 21% of Golden’s donations in the 2018 election below the matching funds threshold were from donors reporting they lived in Maine. That means that the new matching taxpayer funds proposal could essentially put donors from Massachusetts, California, Illinois and other states where Golden hauled in large numbers of contributions in the position of getting a $6 match from the federal government for every $1 they donate to Golden. This proposal may create backlash from constituents who see this as another effort to change the rules of the game to favor Golden, as data shows Republicans are far less likely to participate in programs that use taxpayer money to pay for lawn signs, bumper stickers and television ads. Rep. Chellie Pingree’s potential haul in matching federal tax dollars for her campaign under the new system is hard to gauge because she did not face significant pressure to raise large sums for re-election in the 2018 or 2016 election cycles and in previous, more competitive cycles she relied on large sums of money from her husband, billionaire hedge fund manager Donald Sussman. The proposal to provide matching taxpayer funds to federal candidates for office is rolled up in a broad proposal by Democrats in Congress, and Senate Majority Leader Mitch McConnell (R – Kentucky) came out swinging against the package in the Washington Post over the weekend. In Maine, supporters of the state’s taxpayer funded campaign system, called Maine Clean Elections argued that it would help get “big money” out of politics, but each election cycle since Maine’s system went into place brings new levels of record-breaking spending.